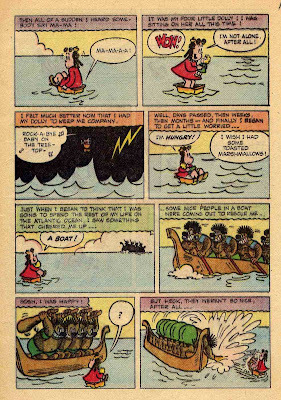 I've gotten some requests to run this story since the excerpt I posted, awhile back, in my essay on John Stanley's cartooning. Sunday morning is always a good time for a Lulu story. Tho' these have been reprinted in Dark Horse's books (while they still keep some of them in print! 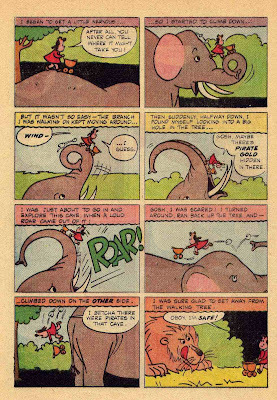 ), few would get the chance to see these stories in their original pulpy-good color. 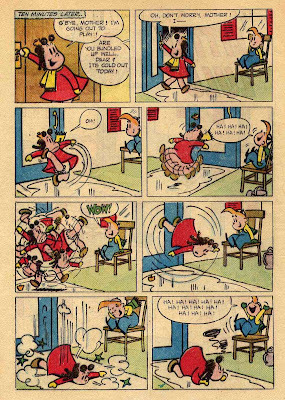 This story comes from the 31st issue of Little Lulu. For reasons we may never know, Stanley did most of the finished art for this issue. This work looks rushed--it tells a tacit story of 11th-hour effort to meet an urgent deadline. 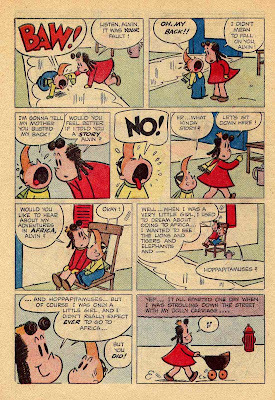 When compared to Stanley's recent efforts for his series "Jigger and Mooch" and "Peterkin Pottle," the art for this Lulu issue seems crude. That said, there is a great vigor to these hasty lines. They live and leap off the printed page. 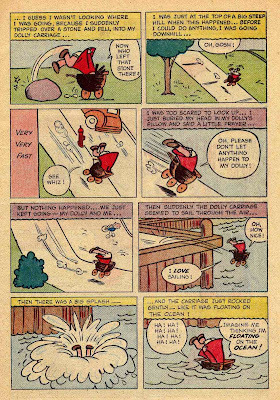 Whatever crisis inspired this cartooning also gave Stanley's writing a more edgy quality--a rare sensation in the pages of the mannered, easygoing Little Lulu. This story, which opened the issue, has much in common with the "Peterkin Pottle" series. Lulu's story is a Munchhausen-esque fantasy that also functions as a wild burlesque of assorted mass-media cliches. It's a one-of-a-kind story that defies the usual structure of this sub-series. There is no moral in this story--just a rambling, extemporaneous antic comedy of errors that mirrors quite effectively the imagination of an excitable child. The hasty, spiky aspect of Stanley's artwork adds to this effect. I like that it takes four pages for the story-within-a-story to surface. Again, this may have been an "uh oh! Let's get these pages filled up!" decision, rather than an artistic choice. 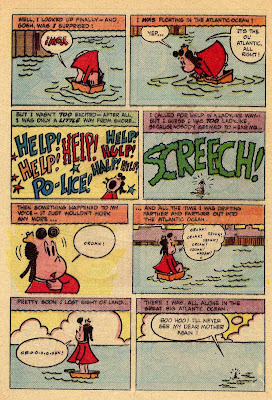 Whatever the case, the low-comedy dawdling of the first few pages has a disarming effect. "Why," the reader may think, "is this story about kids slipping on ice called 'Adventures in Africa'?" Reading this story is like being on a slow train that suddenly and unexpectedly picks up speed. It careens from one moment of comedy and threat to another. 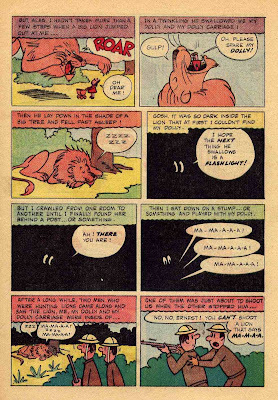 As noted earlier, it shares the "Peterkin Pottle" ethos of making these moments recognizable burlesques of the tropes 1951 consumers encountered in movies, fiction, TV, plays and other comics. 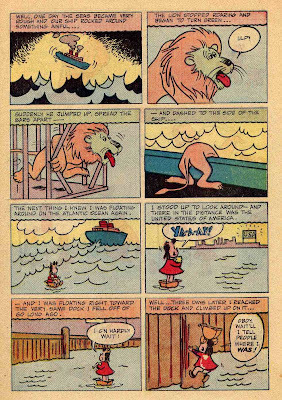 Stanley's lovely cartoon drawings of animals are a highlight of this story. It's curious that his human figures often seem crude here--yet the animals are drawn with a delightful verve and grace. 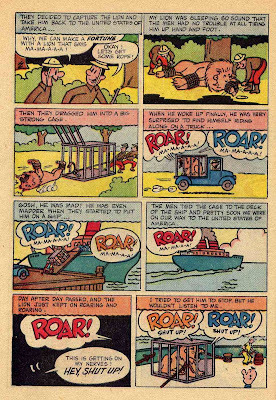 I think this may have to do with a difficulty Stanley had in mirroring the slick, graceful cartoon art of Irving Tripp, who usually drew these stories. 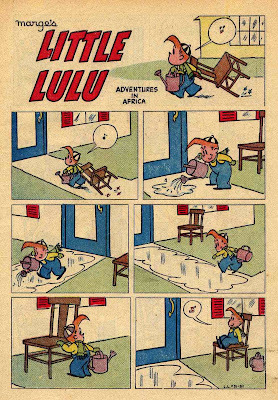 "Adventures in Africa" is an anomaly in the Little Lulu series. It gives us a rare example to see its creator relaxing, and fiddling with the rigid rules that defined this four-color universe. 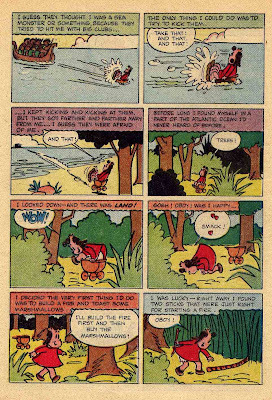 Thanks for this story; it's the first time I've seen it in the original color. 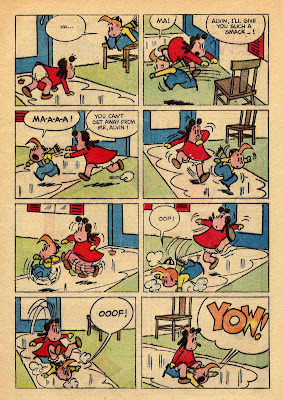 (I know I'm a broken record, but "black and whiting" classic comics is just as bad as colorizing classic films.) 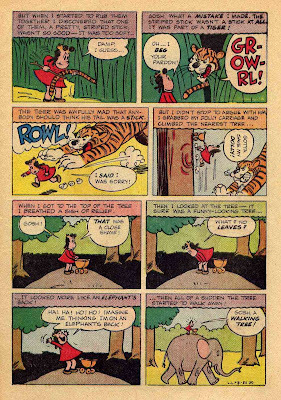 Also, although Stanley is not as polished or consistent an artist as Tripp, my guess is that JS's style is more appealing to the average seven-year-old reader. 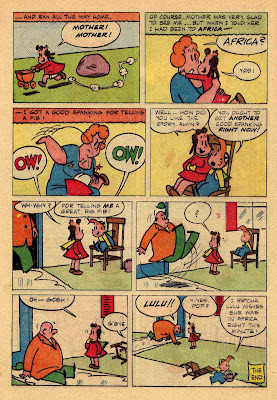 Finally, regarding the last few panels of the story showing Lulu's Pop, I'd love to see an article chronicling the evolution of the appearance of all the Lulu characters, especially Lulu and Tubby's parents and the “fellers”. Alvin's Solo Flight--thanks to CARTOON BREW!